State of the art equipment and techniques to enjoy the best vision possible. Request your appointment today or call to find more information. Maintain optimal eye health by scheduling an eye exam today. Your Eye Doctors in Naples, FL. Call us at 239-262-6288 today. Welcome to Naples Eye Physicians, where our ophthalmologists provide comprehensive vision and eye health care for your whole family. We invite you to explore our approach to high quality vision care and our full range of services, so we can best assist you. This practice started in 1968, and has grown to become one of the most established Naples ophthalmology clinics. We take great pride in doing everything possible to preserve your vision and eye health. 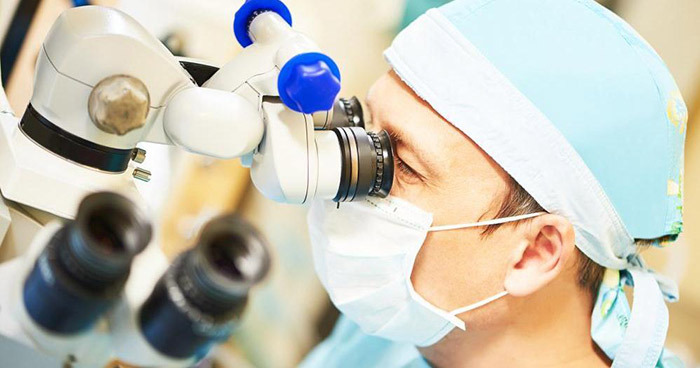 Our board-certified eye surgeons stay current with the most advanced techniques and standards with the goal of giving you the most effective vision treatments. When you see us you will receive the personal care and service you deserve. Cataract Surgery - We can quickly perform cataract surgery at our surgery center, removing the cataracts that cloud your vision. Premium Lens Implants including Multifocal and Toric Lenses - Contact lens implants can help you see more clearly without the need to wear glasses. Glaucoma Surgery and Laser Treatment - Glaucoma is manageable with the help of a qualified eye doctor. If you suffer from glaucoma, we can discuss surgery and treatment options during an appointment. Macular Degeneration - We offer vision correction, eye care supplements, and surgical treatment of macular degeneration. The first step is a personalized consultation. Laser Vision Correction - Laser vision correction can improve your vision effectively and efficiently. Learn more about laser vision correction options, costs, and pros and cons from our trusted eye doctors. BOTOX Cosmetic - Since we understand the muscles around the eye, we are uniquely qualified to perform BOTOX cosmetic injections. We can also administer BOTOX for eyelid spasms, muscle drooping, and wrinkles. Eyelid Problems and Surgery - If you are unhappy with your eyelid shape, or experience drooping or spasms, surgery may be an option. We offer surgical consults as a first step. Diabetic Retinopathy - If you have diabetes, you need special eye care that takes your underlying health condition into account. Dry Eye - Blurred vision, redness, and irritation can indicate dry eye. Let us prescribe medicated eye drops that alleviate the discomfort associated with dry eye. General Eye Examinations - To protect both your eye and vision health, we perform comprehensive general eye examinations for individuals of all ages. Contact Lens Services and Eyeglasses - If you would like new eyeglasses or contact lenses, we must make sure your vision needs remain the same. See us annually to check your contact lens and glasses prescription. Do you have a vision problem we can assist with? We encourage you to schedule an eye exam. Give us a call today at 239-262-6288 and allow us to help you enjoy the best possible vision. Open and operating since the 1960’s, our eye care center is one of the most established practices in Naples. We pride ourselves in providing the care you need to keep your eyes healthy and your vision at its best, which has kept us thriving for the past 40 years. "Naples Eye Physicians is the best at what they do and make you feel right at home." "Great staff. No long wait times. Dr. Byerly is very prompt and gets you in and out quickly. Very thorough service. I highly recommend"